In an amazing interview for Nylon, PVRIS' Lynn Gunn and Tegan Quin talked about sexuality in the music industry along with how important their identity is. Check out what they said below! In this amazing interview, Quin explained to Gunn on how she came out as well and how it was a lot easier thanks to her twin sister, Sara Quin. “Sara came out first. There were some bumps initially with some family, but they came around pretty quickly. I came out next. Sara had weathered most of the trauma of coming out, so my coming out was a pretty easy affair,” said Quin. 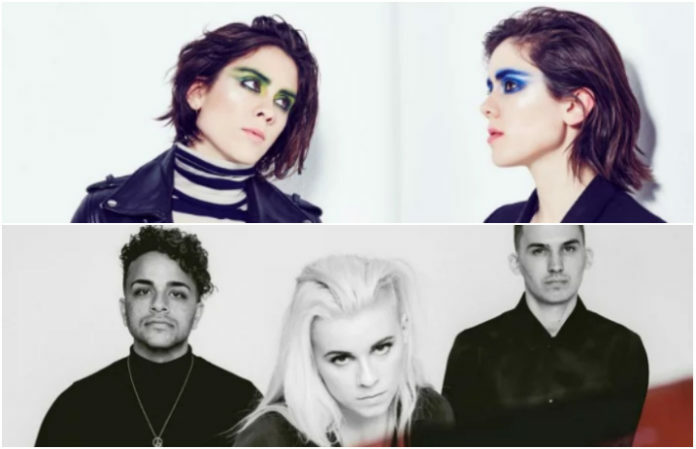 Considering that Tegan and Sara started in 1995 and PVRIS started in 2012, both performers have faced unique challenges along with differences in how their sexuality has been received. “I think everything has changed. And nothing has changed. All at the same time. Depending on the day or which way I squint my eyes, I can be here or back then in a second. It’s just the way it is… but we’ll keep fighting,” said Quin. Now as PVRIS works on their highly anticipated second album along with preparing for a headlining tour in September with Lights, Flint Eastwood and Party Nails, Gunn also works on making sure that PVRIS shows remain safe spaces. Quin feels the same about making sure their shows stay a safe space. “But, in recent years, we absolutely continue to look for ways to ensure it’s truly a safe space. From bathrooms to culturally competent security to our messaging from stage, we ensure our fans feel comfortable, safe, and welcome at our shows,” confirms Quin. Check out PVRIS' upcoming dates below!